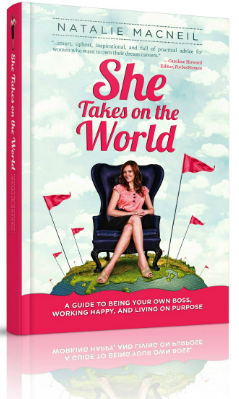 Today, I am celebrating Internet entrepreneur and She Takes on the World blog founder Natalie MacNeil’s new book, She Takes on the World: A Guide to Being Your Own Boss, Working Happy, Living on Purpose, a clever, informative, and inspiring business book. I discovered MacNeil on Twitter as a thought leader and started reading her blog and articles on Forbes-Women.com several years ago. She quickly became a digital diva shero and virtual mentor. As a part of my research and writing journey for my upcoming book, Digital Sisterhood: A Memoir of Fierce Living Online, I read MacNeil’s She Takes on the World. It was a quick and energizing read filled with soulful affirmations and mantras, brilliant and bold ideas, wisdom, authentic conversations with women entrepreneurs who shared their lessons learned, and a heavy dose of inspiration that moved me to adopt and use the “I AM ready” affirmation discussed in Chapter Three on a daily basis. Here it is: “I am ready. I am open to guidance and I am ready to achieve greatness. I AM ready.” This affirmation appealed to my new thought spiritual practices and use of similar affirmations. It is helping me move past my fear of finishing my memoir this summer. Chapter Four offered me a better understanding of my personal brand and how it should reflect who I am from the inside out. My takeaway was about valuing and telling my own story. Here’s what MacNeil had to say: “People buy into a person, a story, an idea – not merely a trinket. A story is better than any mission statement you could craft for your brand. Your story is social currency. What do I mean by that? I mean that people like to talk, and if you give them something entertaining to talk about, they will unconsciously perceive it as valuable. That’s currency. Give your customers that currency, and they will buy from over and over again.” I love the phrase social currency. It reminded me of my feminine currency phrase I use to describe Digital Sisterhood. Chapter Five’s gold nugget was wrapped in a five-step mantra for achieving goals and tasks: “Today I get five steps closer to reaching my goal.” The practice of focusing only on five goals per day helped me take a deep breath of release and ease into the final stages of writing my book. Chapter Nine’s branding and marketing advice and resources were invaluable. They helped me develop a plan to strengthen my online presence. That’s exactly what I need as I move forward with my book PR and marketing efforts. To learn more about MacNeil and her amazing work, click here to watch her video. And if you are a revolutionary woman, join She Takes on the World. Go on and do it. I did!